Work out a crop rotation chart according to your preference in vegetables. 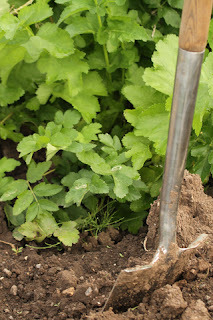 Very important because without it soil-living pests and diseases will steadily increase and continuous cropping with the same vegetable can leave the soil’s nutrients unbalanced. Ideally do ROOTS in year one: beetroot, carrot, chicory, Jerusalem artichoke, parsnip, potato, BRASSICAS in year two: broccoli, Brussels sprout, cabbage, cauliflower, kale, kohl robi, radish, swede, turnip and OTHERS in year three: aubergine, bean, capsicum, celeriac, celery, cucumber, endive, leek, lettuce, marrow, onion, peas, spinach, sweet corn, tomato. Of course if you have the space you can grow neighbouring beds and rotate accordingly to ensure a vegetable crop throughout the year. The rules for sowing seed outdoors are: not too early, not too deeply and not too thickly so check your seed packets for sowing times. If you already have your vegetable patch make a checklist of other jobs to be done in February.